The year is 2349, and the oppressive Starguild Imperium rules Humanity. Supported by a technological monopoly, the Guild has imposed a caste system en society, and most people are trapped in lives of endless work and little hope. It has been more than a century since the Starguild overwhelmed the dissenting voices of the free Seven Worlds system, and began its unchallenged reign. Now, however, the corrupt Imperium is facing its greatest test; the alien Spectrals™ have invaded. Lethal, efficient, and committed to Humanity's annihilation, the Spectrals made contact with the Starguild only a decade ago. Dozens of worlds have already fallen before their assault, and the Imperium is on the verge of destruction. Two months ago, the Spectrals invaded the isolated tourist world of Rhand™. Spectral space bombardment, drop troops, and bacteriological warfare shattered civilization on the planet, but before the attack was complete, the Spectral invasion craft was destroyed. For the last sixty days, chaos alone has ruled Rhand, as the Humans have fought among themselves and with the Spectrals for limited supplies and technology. Into this inferno steps a band of warriors, the reborn champions of a long-lost civilization. One hundred and fifty years before, they had been the leaders of the Seven-Worlds, the greatest Human society to fight against the Starguild. Wearing the Power Armor suits that are called Living Steel, they have been reborn into Humanity's Apocalypse. As the Starguild is destroyed around them, they set out to fulfill the last orders they were given; "Save the ideals and dreams of our people, for better times." Take your place among them. Your mission is to protect what remains of Humanity, and to sow the seeds of a new civilization, one free of both Starguild oppression and Spectral assault. This is the Phoenix, a new beginning for a desperate Humanity. 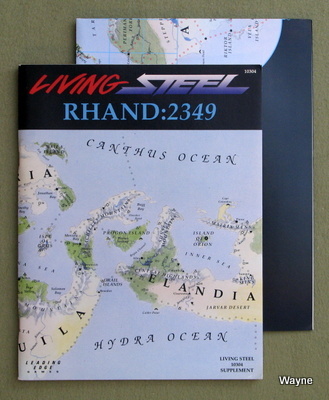 Living Steel takes place on Rhand, a world rich in history. The depth to which the planet's technology, inhabitants, and history are detailed, combined with the exceptional art, yields a role-playing experience of unsurpassed vitality, and creates the perfect setting for high adventure. Skills, training, and medical rules are all provided, along with a unique system for repairing vital technology. 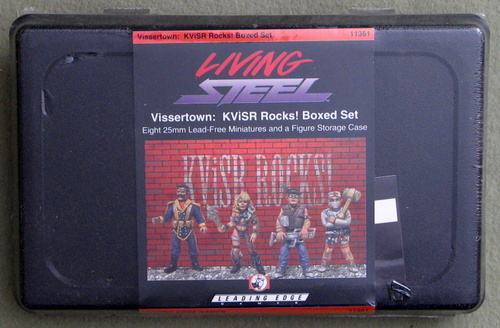 Living Steel also contains a revolutionary combat system, which is fast, playable, and realistic. It is fully compatible with all other Leading Edge Games products, especially the Dragonstar Rising Power Armor Combat Game. Complete and ready to play, Living Steel is a system limited only by your imagination. • Scenarios and Optional Rules"
Box Set contains 3 booklets, character sheets, and poster map. "Rhand is a fallen world, a world at war. A shattered humanity retreats each year before a wave of ice. Driven by hunger, the cultures of Rhand fight among themselves for the planet's dwindling resources, slowly reverting to complete barbarism. The faceless, inhuman Spectrals stalk through the ruins, existing only to destroy humanity. In this chaos the only real stability lies in the city-states, small nations struggling to survive in a land of ice, war, and hatred. Beleaguered and isolated, the city-states and indeed all of Rhand have only one hope for the future: The ORCA. • Encounter the wily Jineta, master horsemen and rulers of the plains. • Deal with the Clochardi, subtle and powerful humans who wrest life out of the icelands. • Aid the reclusive Vid in their battle to save the vanishing forests they have made their homes. • Combat the Vissers, warped, malevolent creatures that were once human. • Pursue the twisted people who call themselves Blades, madmen who have betrayed their race for greed, power, and hatred. • Battle the jet-black, unthinking Spectrals, the enemies of all life on Rhand. • In the chaos of combat you must stab, slash, duck, and parry. • Aim your blows where you wish — the limbs, the head, or even the heart. • Batter down your opponent's shield to create an opening for an ally. • Drag an enemy from horseback and continue the fight with or without weapons. • Feel the tension of the bowstring on your fingertips. • Wield the forces of magic — the powers of the elements and a full range of mental abilities. • Master any skills you wish by study or field experience." "The flag of the Seven Worlds System stood for the greatest ideals of humanity. Each of the Seven Swords, the legendary units which led the Seven Worlds military was represented, and each of their unit symbols was proudly displayed. From the glorious battles of the Red Swords to the unending search for truth of the White, it was always the Seven Swords which led the way. When at last the Seven Worlds were defeated by the alien Dragoncrests and the oppressive Imperium, many members of the Seven Swords were saved, and placed in stasis to wait for another chance. 150 years later that chance came on the isolated, besieged world of Rhand, and Operation Seven Swords was begun. Operation Seven Swords, a supplement to the Living Steel High-Tech Role Playing System, takes a close look at the Characters. It includes a thorough history of the Seven Worlds, information on the ideals and campaigns of the Seven Swords, and expansions on the existing rules for Ringers. 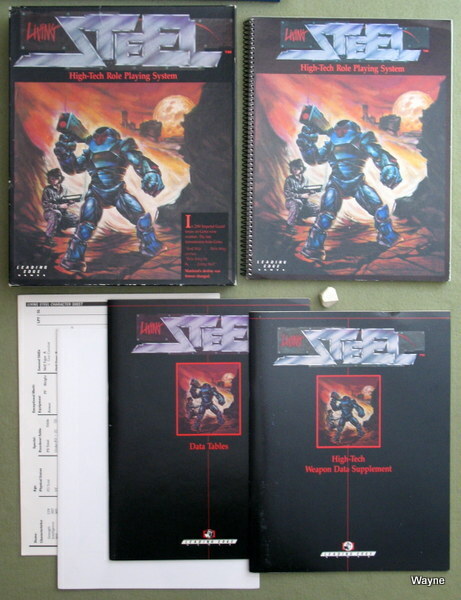 Also included are detailed discussions of Alpha Team characters, their histories, skills, and equipment; the ORCA teleportation system; the breakdown of society since the Spectral Invasion; and a starter scenario for the Apocalypse Setting. 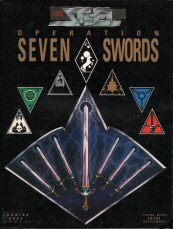 Operation Seven Swords is the ideal supplement for Living Steel players and Gamemasters alike, and will make the fascinating world of Rhand even more vivid." "Somewhere in the darkness, hidden from the lights and noise of Vissertown, a man without a soul is sacrificing people to his Spectral master. If he completes what he has begun, then the power of the Spectrals will rule the city, and the disorganized gangs of Vissertown will unify, becoming an army of frenzied killers. The only people in a position to stop the Spectrals are the members of a small Recon Team. They are hopelessly outnumbered, badly equipped, and all alone in complete chaos. They have almost no chance of success. They are also your team. If you can pick your way through 60,000 suspects and 3,000 gangs, if you can fight your way past the killer and all his men, if you can find the place that has been soaked in the blood of the innocent... then you will come face to face with the Spectral, and the fate of Vissertown will be in your hands. 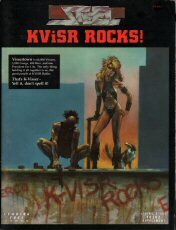 KViSR Rocks! 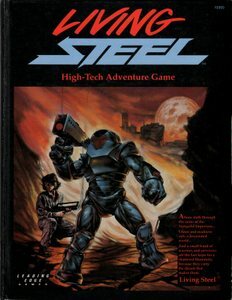 is a scenario for the Living Steel High-Tech Role Playing System, and features a fast-paced adventure that is filled with challenge, entertainment, and action. In addition to the scenario, detailed rules for Vissers are included, as well as guidelines for running Spectral Pathfinders. Plus the city of Vissertown itself, completely reusable and an ideal environment for future missions. From the rooftops to the sewers, from the palace of the President to the back room of the Toxic Cafe, KViSR Rocks! is guaranteed to provide countless hours of exhilirating play in your Living Steel campaign." 1987 ... 68 pages ... LEG 10302 ... ISBN 0945571328? "A Grav Vehicle from Trident/RMBK has been shot down in the wilderness. On board are the secrets of RMBK's advanced science, including the answer to the mysteries of the DRGN Combat Suit. Your team has been assigned to the search... but the Imperium is also hunting for the downed vehicle, with all the forces at its disposal. Your search will take you deep into the wilderness, through the ruins of a bombed-out Subcon, and into deadly combat with the most powerful Imperial unit you have ever faced: the top-secret Imperial Robotics Section, a covert unit which uses illegal technology to do the bidding of the Imperium. Trident/RMBK will test the skills of your entire Operation Team, from the Swords in their Living Steel to the members of the Alpha Teams. Those who pass the test will wield the full power of the DRGN Combat Suit, and will be ready to take the next step in the quest for RMBK's lost technology. Trident/RMBK is a scenario for the Living Steel High-Tech Adventure Game, and begins to reveal the story of Trident's renegade RMBK division and its technological breakthroughs. 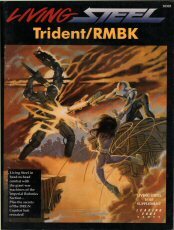 Background on Trident/RMBK is included, as well as Skirmish and Search rules, and complete information on the Imperial Robotics Section." This supplement to Living Steel presents the key people, places, and powers of Rhand at the time of the Awakening. From pole to pole, from Trident/RMBK to the Imperial Guard Landing Zone, it's all here. All 150 Subcons are discussed, including what types of equipment they built and what machinery has survived the Apocalypse, The Bondsmen, Landcaste, and Starcaste communities are also presented, along with the Resorts and the locations of the major Visser encampments. 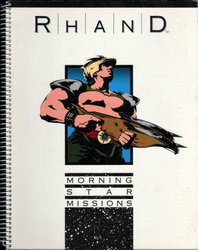 RHAND:2349 is the definitive sourcebook for Living Steel players and Gamemasters alike. Perfect for the Gamemaster, with enough material for hundreds of adventures. Perfect for the Player: the next time you need something, you will know which communities to search... and which to avoid. And as a special bonus... a full color, 17" x 22" map of the world of Rhand." 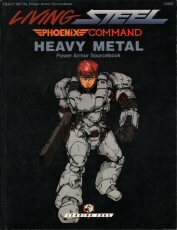 HEAVY METAL enhances the firepower and survivability of all types of Power Armor, and makes an ideal companion to Living Steel and to High-Tech gaming using Phoenix Command." "Dragonstar Rising presents the fascinating story of the early years of the Seven Worlds. The background and history of all the combatants are covered in detail, as are the innovative technologies used and the devastating abilities of Living Steel Power Armor. 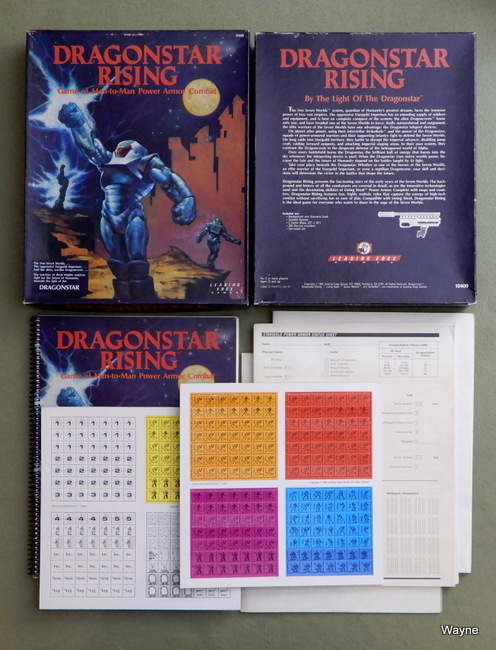 Complete with maps and counters, Dragonstar Rising features fast, highly realistic rules that capture the energy of high-tech combat without sacrificing fun or ease of play. Compatible with Living Steel, Dragonstar Rising is the ideal game for everyone who wants to share in the saga of the Seven Worlds." 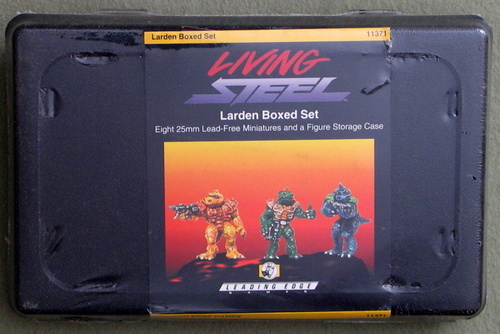 Eight 25mm Lead-Free Miniatures and a Figure Storage Case.